Effortlessly Create Schedules for Staff, Student Workers & Volunteers. Manage Service Point Staffing With Ease! Stop relying on spreadsheets and spending countless hours manually creating schedules. It’s time to click those spreadsheets to the curb and move to LibStaffer, a one-stop shop for staff and service point scheduling. Whether juggling multiple service points with different staffing needs and duties, or handling restrictions on who can work when and for how long, LibStaffer takes the hard work out of staffing and scheduling so you have time for more important projects. 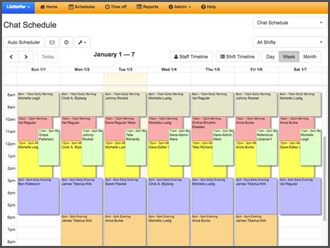 Organize multiple schedules in one place. Restrict staff from working over their max hours. Add shift notes and assignments to remind staff of duties. Mobile optimized so you can untie yourself from the desk. Communicate with staffers with built-in email functionality. Optionally allow staffers to favorite / claim shifts. Manually scheduling staff is a tedious and thankless job that is often outdated the minute the schedule goes live. LibStaffer’s auto-scheduler technology makes it easy to schedule staffers in just seconds. Just think of the time-savings. Run the auto-scheduler for specified date-ranges. Respects time-off requests, holidays, and max hours. Choose the number of shifts/day each staffer can work. Won’t double-book staff across schedules. Restricts staff from working over their max hours. Allows staff scheduling of 'Preferred Shifts' first. Displays a detailed activity log of who was scheduled. Rather than contacting you with schedule changes or time-off requests, encourage staffers to work together and funnel all time-off requests into the dedicated management area in LibStaffer. The admins can then approve or deny requests in one central location. Staffers can swap shifts…with or without admin mediation. Control overtime with enforced max hours restrictions. Search for shifts to swap by date range, shift name, or staffer. Email swap requests with customizable note. Give up shifts into a centralized pool… and others can pick them up. Route all time-off requests out of your email and into the dedicated management area. 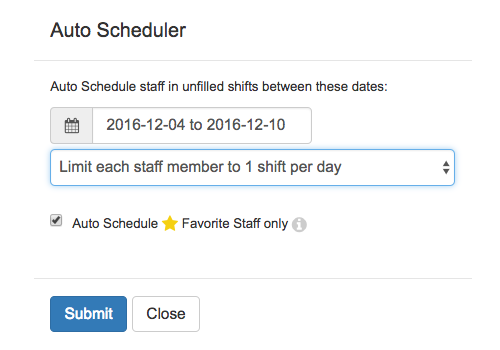 Staffers can submit time-off requests tagged with customizable categories (i.e. vacation, conference, sick). Turn on mediation and approve or deny all time-off requests. 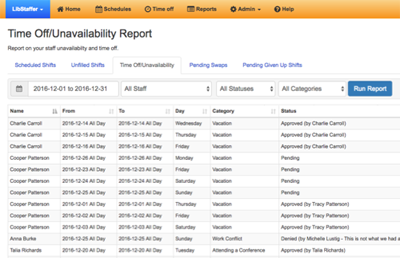 Access detailed time-off reports by user and in the aggregate. Receive customized email notifications containing schedule, admin notes, and detailed shift notes. Connect their schedules to Outlook/Exchange for auto-delivery right into their calendar. Feed schedule into Yahoo, Google, etc. with iCal feeds. Claim / Swap shifts right from their smartphones. Submit and view time-off requests on tablets, smartphones, or desktop computers. Create on-demand reports for immediate decision-making. Use Reports & Statistics during staff evaluations, too. Filter by date, service point, or staff member. Reports on Scheduled and Unfilled shifts. Reports on Time-off Requests, Pending Swaps, and 'Given Up' shifts. Time-off requests can be filtered by Status & Category. Printer-friendly and export options for reports. 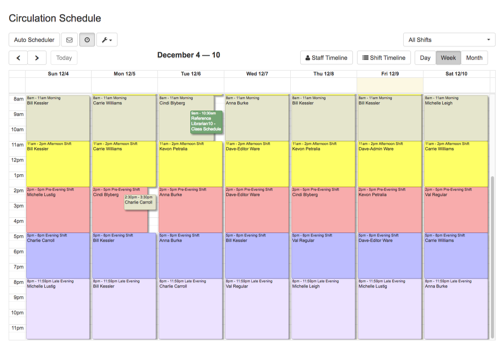 Increase Efficiency: View everything in one place while enforcing scheduling/staff restrictions. Convenient: Mobile-first & cloud-based means you can access LibStaffer anywhere, on any device. Private & Secure: All information is stored behind a secure login. Optional IP restrictions add another layer of protection. Be Better Informed: Communicate schedules and shift changes quickly & easily and run reports on your schedules dynamically. Team-Building: Encourage staffers to work together! Empower them by putting shift-swapping/giving up shifts in their hands. Pushed Communications: Receive schedule and staff changes by email or feed right into your Calendar. Mobile Freedom: View and manage your schedule by swapping or giving up shifts and requesting time-off from any device…. anywhere… anytime. Know What You Need to Know: Got shift responsibilities? The system stores and communicates your duties so you'll always know what you need to do during your shift. 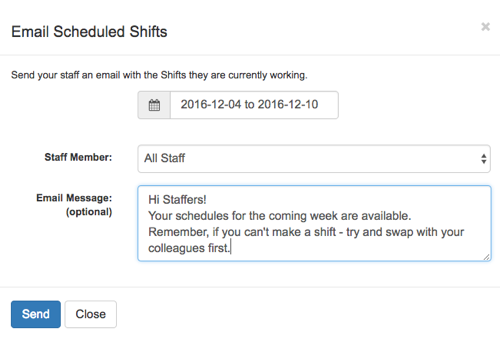 No More Juggling: View your shifts across multiple schedules / desks. The system keeps your max hours and time-off sorted so you don't have to!